A dental abscess is a localized collection of Pus is a thick fluid which normally contains white blood cells, bacteria and dead tissue. The abscess occurs due to an infection with bacteria. These infections occur commonly in people having poor dental health and also lacking proper and timely dental care.There are three types of Dental Abscess - Gingival, Periapical and Periodontal. Gingival abscess affects only the gum tissue and does not affect either the tooth or the periodontal ligament. Periapical abscess is the most common type of abscess and it starts from the dental pulp which is in the center of the tooth. 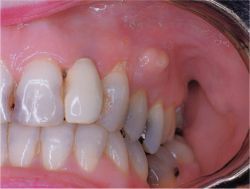 This type of abscess happens when there is complication due to tooth decay. Periodontal abscess begins at the supporting structures of the teeth like periodontium that is located between the gum and tooth. This happens when there is gum disease which is inflammation or infection of the tissues that surround the teeth. A periodontal abscess results in swelling next to a tooth and hence is also called as a gum boil. The symptoms of dental abscess are - chills, diarrhea, high fever, loose tooth, nausea, redness of the mouth and face, tooth pain, tooth swelling and vomiting.The signs of dental abscess are - cavities, gum inflammation, oral swelling, pus drainage, tenderness with touch and difficulty in fully opening your mouth or swallowing. Periapical abscess requires root canal treatment and this treatment is performed to save and restore the dead inner part of the tooth. If the abscess is periodontal the dentist will clean the 'pocket where the abscess had formed. This prevents recurrence of infection.